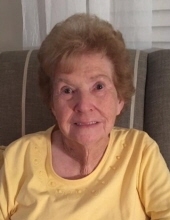 Funeral services for Sara Margaret Holden Neal, 87 of Heath Springs, will be held at 11:00 o’clock am, Monday, April 1, in the sanctuary of Oakhurst Baptist Church. Rev. John Rogers will officiate. Burial will follow in the church cemetery. Mrs. Neal loving wife of the late Coniver Oscar Neal, Jr. passed away, Thursday, March 28, at Heath Springs Residential Care Center. Born in Kershaw, she was a daughter of the late George Holden and Zoetta Johnson Holden. Mrs. Neal retired from Skyline Ltd., a faithful member of Oakhurst Baptist Church and a graduate of Kershaw High School. She enjoyed the time spent with her family and helping others. She also loved to cook and quilt. Surviving are 2 daughters, Rhonda Meadows and her husband Tim of Florence and Teri Horton and her husband Phil of Heath Springs; 4 grandchildren, Anna (Brad) McKenzie, Chelsea (Justin) Williams, Carson (Vance) Stogner and Connor Horton; 5 great grandchildren, Frankie Perkins, Riley Williams, Hayes Williams, Matthew McKenzie and Haley McKenzie; 2 sisters, Barbara Hinson , Diane Vincent and a brother, Frankie Holden and his wife Brenda all of Kershaw. In addition to her parents and husband, she was preceded in death by 2 brothers, Don Holden and Sam Holden. The family will receive friends, Monday, April 1, one hour prior to the service beginning at 10:00 o’clock am in the church fellowship hall and other times at the home of Teri and Phil Horton. Memorial contributions in memory of Mrs. Neal may be made to Oakhurst Baptist Church, 394 Barrett Rd., Heath Springs, SC 29058. To plant a tree in memory of Sara Holden Neal, please visit our Tribute Store. "Email Address" would like to share the life celebration of Sara Holden Neal. Click on the "link" to go to share a favorite memory or leave a condolence message for the family.